Food bloggers, writers, and culinary professionals made sweet and savory pies and gathered for Pie Party Potluck LIVE at the Institute of Culinary Education in New York City on October 3rd, 2015. 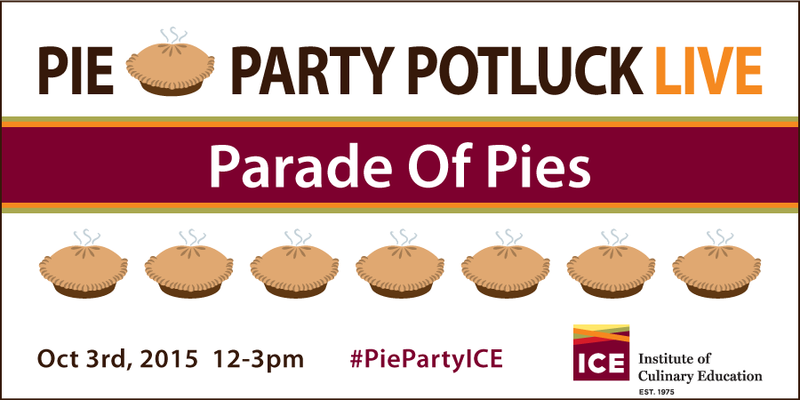 This event was produced by Jackie Gordon and Ken Leung and sponsored by Institute of Culinary Education (ICE), Wüsthof, Anolon, Cabot Creamery, King Arthur Flour, Dub Pies and more. Links to event press coverage is at the end of Jackie’s recap of the event. 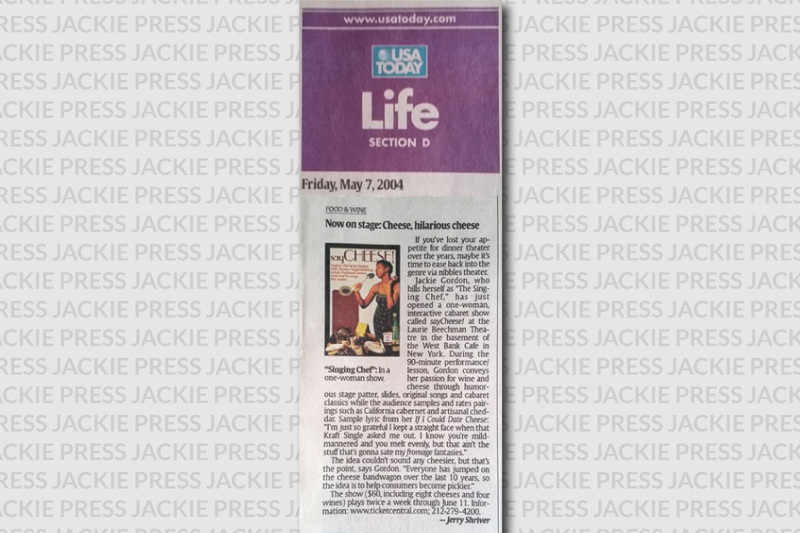 Chocabaret coverage in the Metro New York daily paper. New York artisan chocolates matched to music — stop squinting your eyes, you read that correctly. 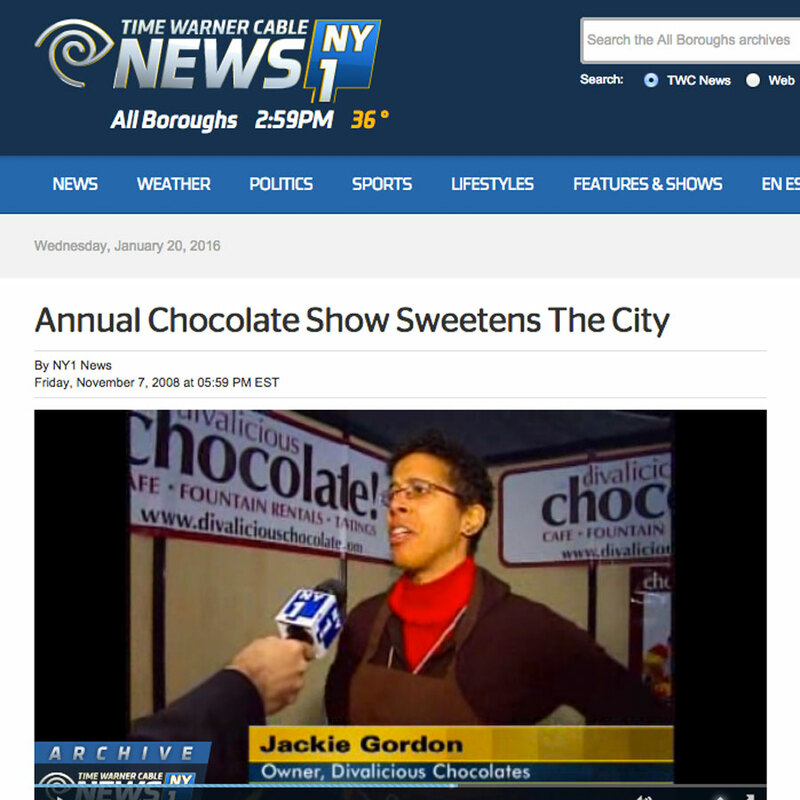 Jackie Gordon, a singing chef and chocolate maker, will serenade you while you taste chocolates from New York’s best chocolate makers. A flavor wheel, palate cleanser and rating scale will help you use all of your five senses. 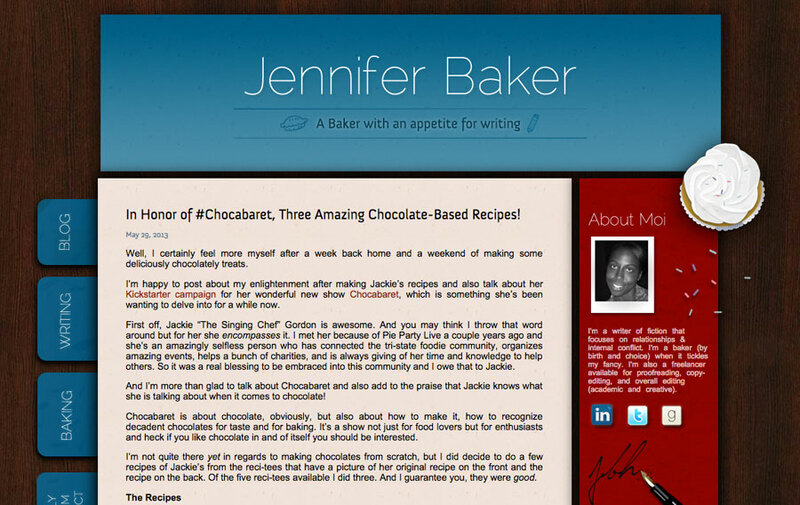 Jennifer Baker wrote about “Chocabaret: a tasting of NY artisan chocolates matched to songs with Singing Chef Jackie Gordon” . 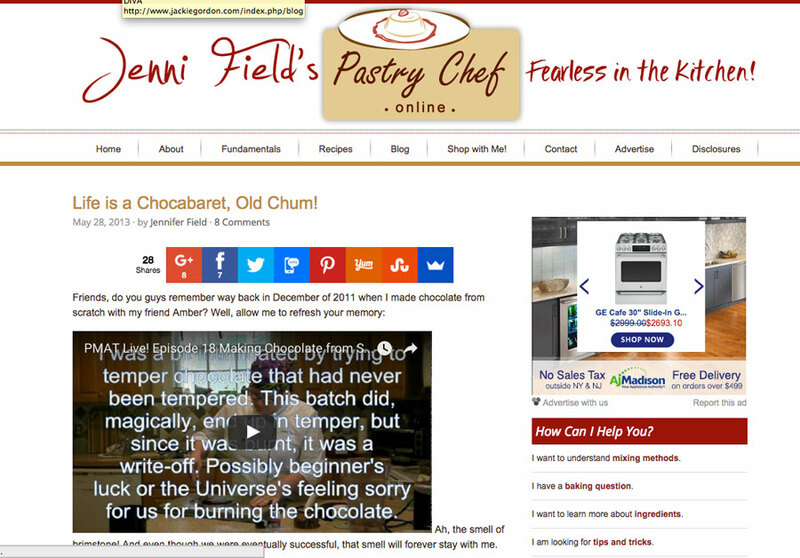 Jenni Field of Pastry Chef Online wrote about “Chocabaret: a tasting of NY artisan chocolates matched to songs with Singing Chef Jackie Gordon”. 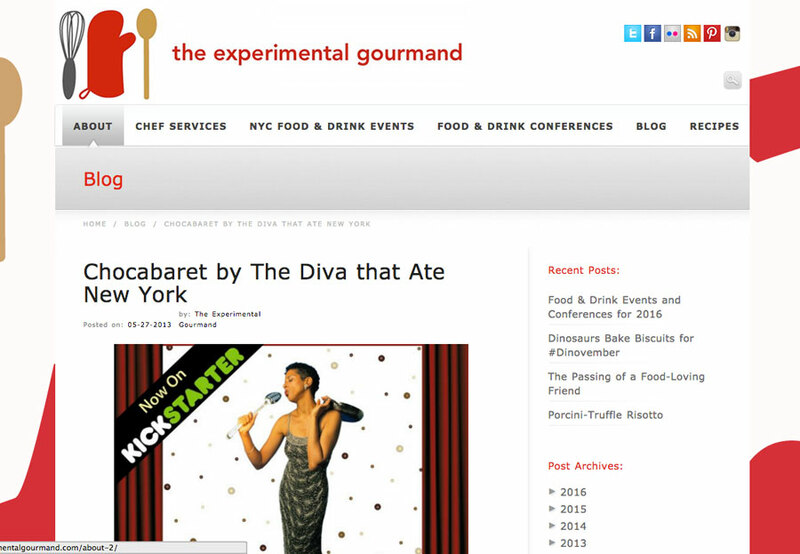 The Experimental Gourmand wrote about “Chocabaret: a tasting of NY artisan chocolates matched to songs with Singing Chef Jackie Gordon”. 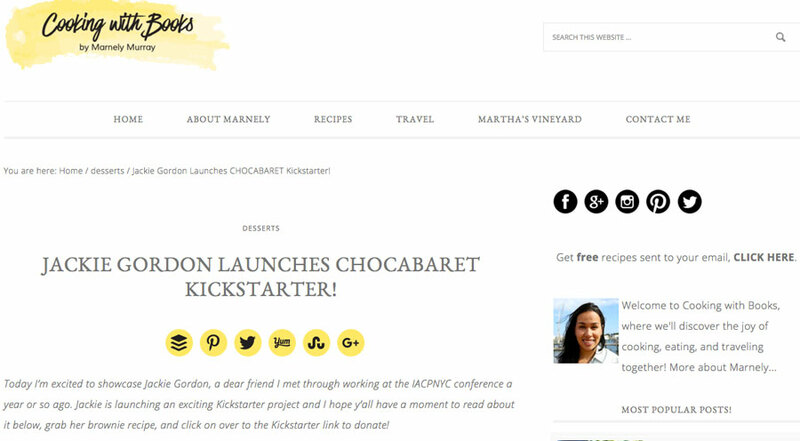 Marnely Rodriguez of Cooking With Books wrote about “Chocabaret: a tasting of NY artisan chocolates matched to songs with Singing Chef Jackie Gordon”. 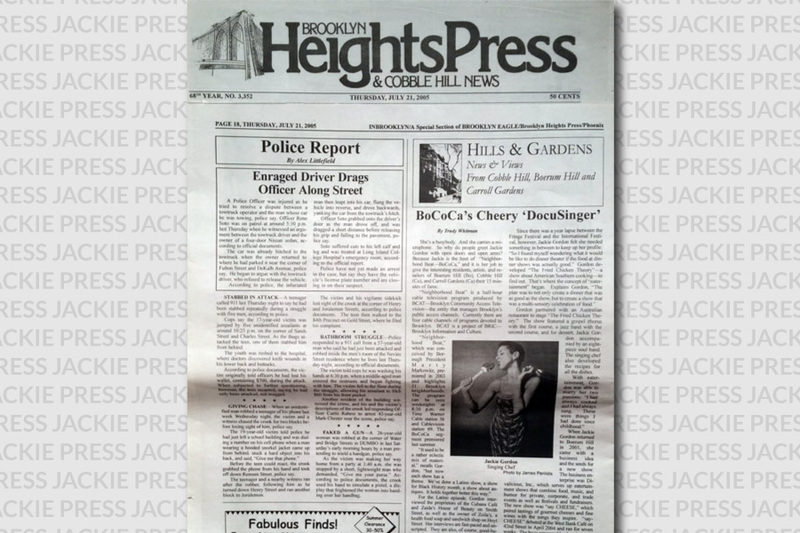 Coverage of Jackie Gordon Singing Chef in Brooklyn Heights Press regarding her hosting Neighborhood Beat BoCoCa TV show on BCAT. In good company, sipping glasses of fine wine while nibbling delectable varieties of cheese would make any evening perfect. 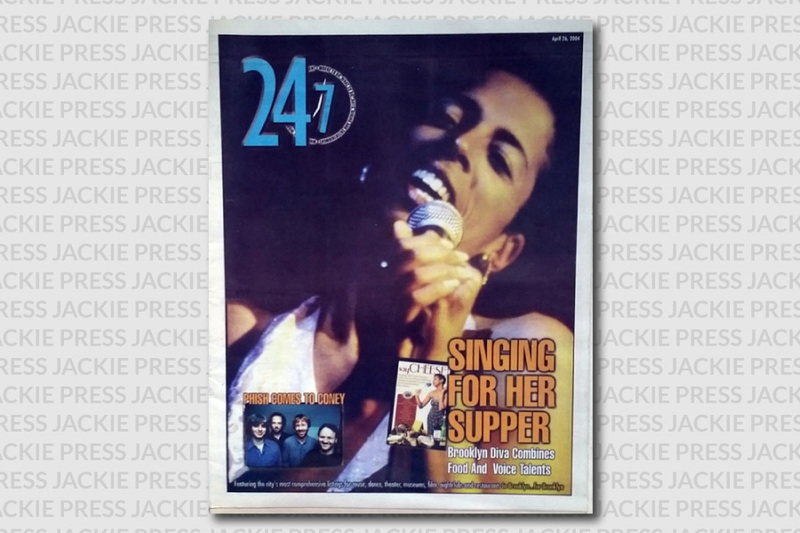 Add to these activities the very enjoyable presence of hostess, humorist, songstress, culinary expert, educator and all around charming individual Jackie Gordon, aka The Singing Chef, and you have a memorable night. In Egypt, way back when, a desert bedouin stored some milk in a leather satchel and set out on a journey in the scorching Saharan sun. When he went to refresh himself several hours later, all he found were chunky curds and whey. Thirst-quenching? No. But the mistake was delicious, and experts think that this is how humans first stumbled upon the creation of cheese, that rich, fatty delight that has tantalized mankind ever since and helped pizza reach new heights of delectability. These days, cheese is a lot easier to come by, and you probably don’t think twice about chucking that cellophane package of pre-wrapped slices into your shopping basket. But the self-proclaimed “singing chef” Jackie Gordon thinks you should. Brooklynite Jackie “Divalicious” Gordon strides up to the microphone on the small stage of the Laurie Beechman Theatre in Manhattan. After a rousing rendition of Tommy Wolf’s “Say Cheese,” Gordon rips off her white lab coat. Under the wrap is a Billy Holiday-style brown satin gown—adorned with yellow satin wedges of cheese. Food has been an ongoing subject in the theater this year, and the big kahuna in that department is Chef’s Theater at the ritzy Supper Club. As we wrote in an earlier column, that show is really about the cuisine; the entertainment is essentially an afterthought. Happily, we’ve just come upon a much better mix of taste and talent in Say Cheese!, a cabaret experience at the Laurie Beechman Theater. 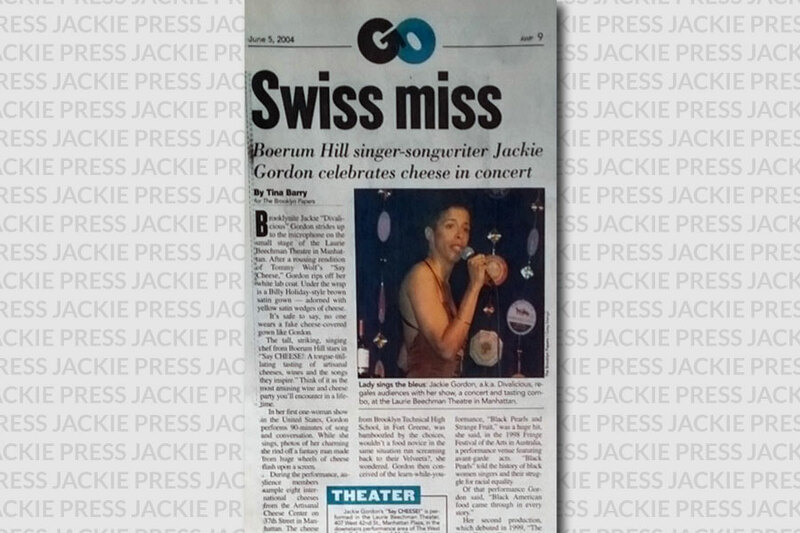 Growing up in Boerum Hill, Jackie Gordon whiled away her childhood “always singing and always cooking.” “It felt natural to cook and sing together—I just had to figure out how,” laughed Gordon. If you’ve lost your appetite for dinner theater over the years, maybe it’s time to ease back into the genre of nibbles theater. Jackie Gordon, who bills herself as “The Singing Chef,” has just opened a one-woman, interactive cabaret show called sayCheese! at the Laurie Beechman Theater in the basement of the West Bank Cafe in New York. During the 90-minute performance/lesson, Gordon conveys her passion for wine and cheese through humorous patter, slides, original songs and cabaret classics while the audience samples and rates pairings such as California Cabernet and artisanal cheddar. A cabaret show on cheese will be given on April 28 at 7:30 p.m. at the Laurie Beechman Theater at the West Bank Cafe, 407 West 42nd Street. 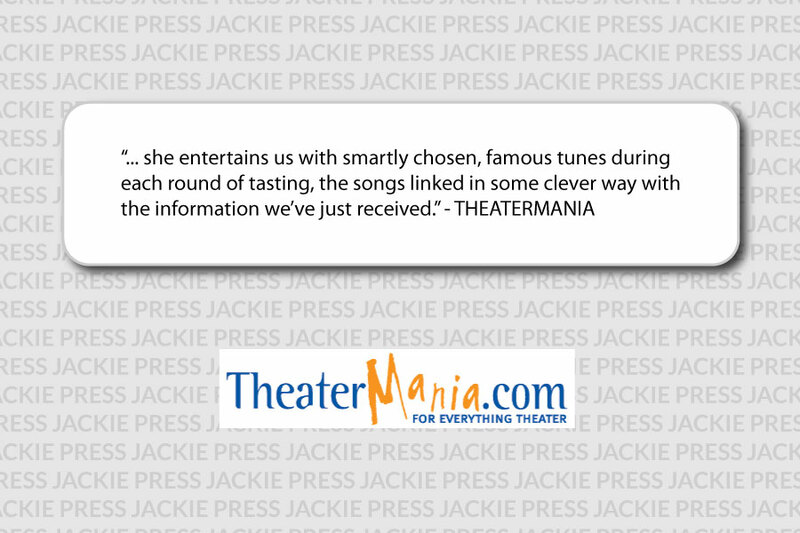 Jackie Gordon of Divalicious, Inc., a company that pairs food and music, will perform. There will be tastings of cheese from the Artisanal Cheese Center and wines. Gordon is a trained cook, having worked as head chef at countless restaurants throughout her career on both sides of the globe—New York City and Melbourne, Australia. 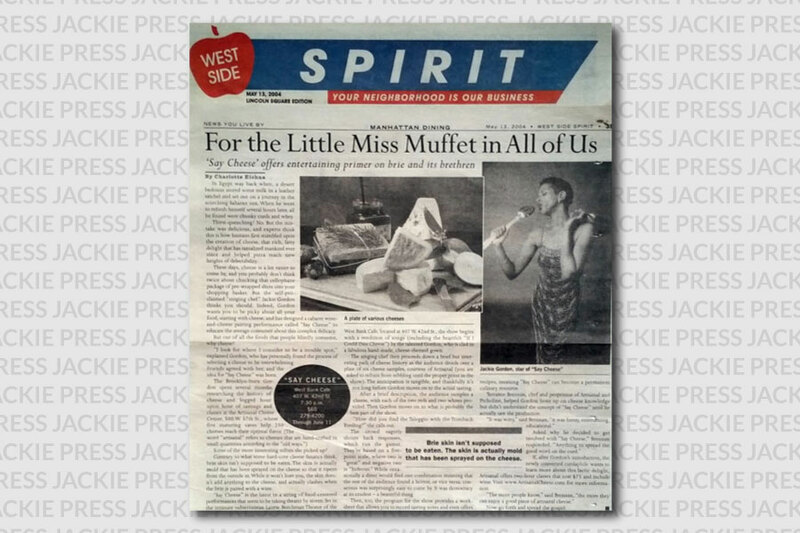 She is also a world-class singer/performer, and after years of being “Jackie of two trades,” she decided to merge her talents. “I create shows around food and music,” said Gordon. 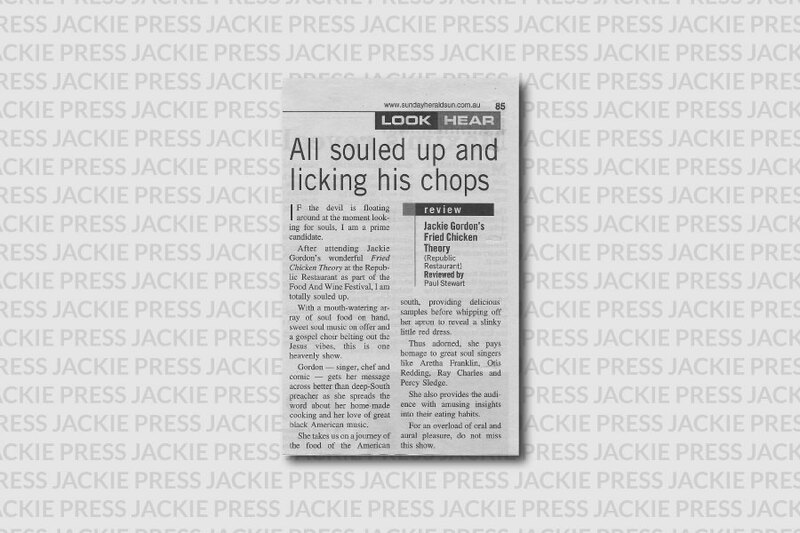 This is a the photo from coverage of “The Fried Chicken Theory According to Jackie Gordon” in Melbourne Weekly Magazine. If the devil is floating around at the moment looking for souls, I am a prime candidate. After attending Jackie Gordon’s Fried Chicken Theory at the Republic Restaurant as part of the Food and Wine Festival, I am totally souled up. With a mouth-watering array of soul food on hand. Sweet soul music on offer and a gospel choir belting out the Jesus vibes, this is one heavenly show. 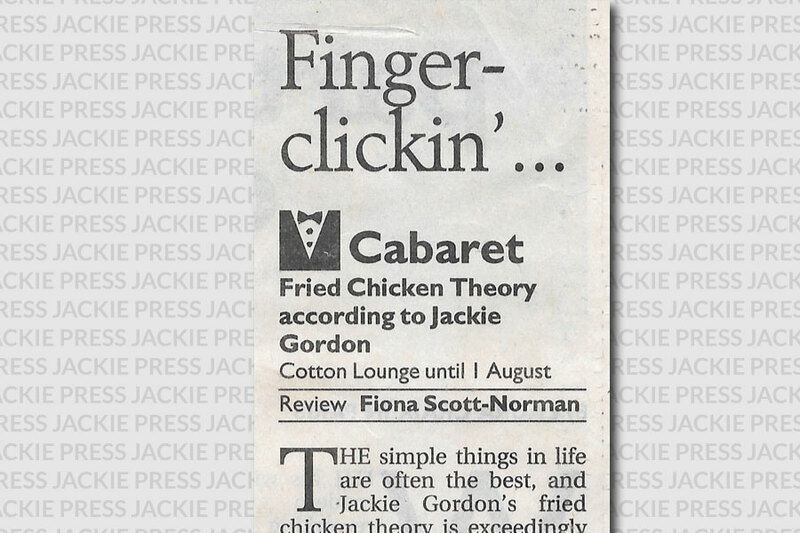 The simple things in life are often the best, and Jackie Gordon’s fried chicken theory is exceedingly simple. 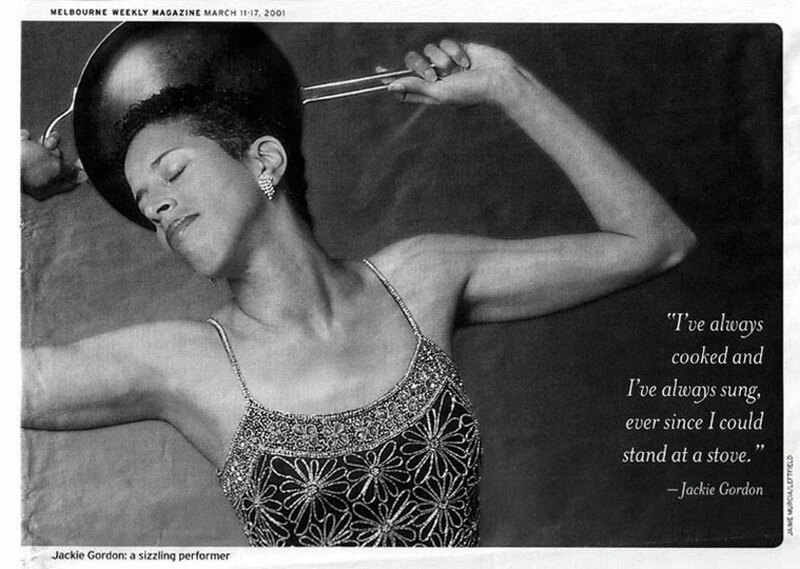 This American born, half-Jamaican, open-hearted singer/chef says that if you eat soul food, the soul goes through you. Such a connection would be difficult to prove to the satisfaction of the AMA, but it feels right when you’re listening to some sweet blues and soul after a bowl of smoked sausage and seafood gumbo.